Today i struck one of those forgotten areas of my mind. An area i couldn’t put a name to but could see. A childhood cartoon with good memories attached, even if i can’t quite remember the events of the cartoon. I was fortunate enough to discover the name of this nagging memory through some lucky google searching. 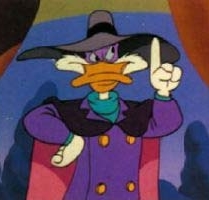 Darkwing Duck. Anyone else remember it? Awesome cartoon. I seem to be reminiscing about kids shows a lot lately. Paddington Bear, Little Bear, Franklin, Busy Town . . . good shows all of them, at least they were when i was 9 or younger. But i’m sure all of them were better than the shows kids have today. I have seen some absolutely terrible kid shows recently. Maybe the shows i watched were actually bad . . . no, no the shows these days don’t compare. The Night Garden? Very weird show. Kids these days have to watch either shows lilek that or some silent, scrawny red-head mope about a gym! How does that compare to good-old spot? So seriously, get some of that past quality out there!